Come for: Brad Pitt throwing a cooler at the wall. Stay for: the best movie about baseball statistics this decade. My favorite character in Moneyball is Microsoft Excel. My second favorite is Art Howe. Huh. Chris Pratt was Scott Hatteberg (and according to Wikipedia, he replaced Scott Hatteberg in the role; that's gotta be demoralizing for Scott). I'll have to go back and rewatch. I'm not a baseball fan/junkie, but I found this movie fascinating because (to me) it was really about change management and leadership more than anything else. Plus I love the scene where Beane goes and has a chat with David Justice and points out to him that the Yankees are still paying half his salary. To play against them. I have been surprised by the number of people who don't really know baseball at all who have told me they enjoyed this movie. Most of the other movies posted today, it's obvious to me why that would be the case. 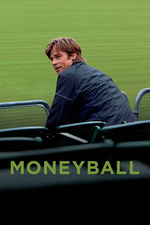 But Moneyball spends so much time talking about, well, nerdy stuff that the breadth of its appeal kinda floors me. But as nubs points out, its themes definitely apply in other contexts. Everybody talks about how A League of Their Own is sure fire waterworks, but the scene at the end when he's listening to his daughter's tape destroys me every time. I'm glad this moment in baseball's evolution was captured in popular culture because it was nothing short of a total revolution in the way teams do business. There are very few teams now that don't at least incorporate this approach into their operations and those teams are terrible (eg the Phillies, the Diamondbacks, and the Rockies). It's been the biggest change since baseball was integrated in the 40s and 50s. Maybe the weirdest thing about the movie is how I have to keep saying "oh right , that's actually Philip Seymour Hoffman playing Art Howe." So I heard an interesting argument the other day which sort of clashes with this film. Brad Pitt is portrayed here as a modernizer, ahead of the dinosaurs and full of smart ideas (along with a bit of a chip on his shoulder because of the college recruitment maybe wasting his potential). Yet here's the thing about sport. It's always possible to play the numbers and come up with plays that will let you technically win, or do well, but does it necessarily make for a good spectator sport? After all, sport isn't just about winning, it's about winning over the crowd too. Now I don't actually care that much about sport, but ultimately people are following it for the quality of the game and the individual stories, right? Not for numbers going up on a chart (and I say this as a statistician who enjoys that sort of thing). Of course Beane reaped what he sowed here, as if a tactic works for a small team, it can certainly work for a bigger team with more money. I think this movie is really relatable though. I remember my mom (a children's theater director) mentioning that she felt sorry for Phillip Seymour Hoffman's character as she couldn't imagine having to put on a show where someone else cast the roles and keeps switching the actors on her. And thinking about it . . . I feel like lots of people have had a work situation like that - both having to work with someone else's decisions and making the best decision possible and getting static from everyone else on your team. Now I don't actually care that much about sport, but ultimately people are following it for the quality of the game and the individual stories, right? Not for numbers going up on a chart (and I say this as a statistician who enjoys that sort of thing). To speak to your question, I'll point out that baseball has several aspects to it that are pretty unique in the world of sport, and certainly so in American sport. * The game has been played professionally by many of the same organizations for more than 100 years. Contrast that with the NFL, which only game into existence as an entity in 1920, but only came together in its current form in 1966, when the existing NFL and the AFL merged. * In that time, the rules of baseball and the game balance has not changed substantially. Athletic training has improved enormously, of course, but the bats are still wood and the basepaths are still 90 feet. You ever notice that on a routine grounder to short, the batter is generally thrown out about two steps shy of first? It's been like that since day 1, despite all those improvements in athletic training. Again, contrast that with the NFL, which makes significant rules change each year. In 1972, the NFL even moved the hash marks closer together, creating an explosion in passing offense. * Statistically, the game is largely the same. While there have been lots of streaks and dead periods, a good player in 1920 was batting .300, the same as a good player in 2015. * Historical lore in baseball is still a thing. Babe Ruth is still revered, while most equally great football players of Ruth's era are largely unknown. Which is a long way of saying, baseball numbers matter more than in other sports. People keep score at games. It's an actual hobby, to keep your own scorebook. So, baseball is an odd duck. A "perfect game" is actually quite boring to watch -- after all, there is no offense happening, by definition. But ... it's ... a ... perfect ... game. The movie mentions this in its closing epilogue, that the Red Sox and other rich teams started using Beane's tactics. An interesting thing to bring up here is that Jonah Hill's character is actually a composite character, standing in for two people, J.P. Ricciardi and Paul DePodesta. They both went to the Mets after serving under Beane. At the Mets, they were hired by Sandy Alderson, who was previously Beane's "mentor" in Oakland. One in particular that lends itself both to a deep statistical mania and fights against that deep statistical mania -- every play has two distinct phases -- pitcher vs. batter (one-on-one) and runner(s) vs. defense (one/two/three/four vs. nine). Football is always 11-on-11 (with a little variation on kicking plays), basketball is always five-on-five (or one-on-zero, for foul shots), etc. The vast majority of other sports are either one-on-one or many-on-many (then there's golf, which is essentially one-on-zero). So you have a situation with a few obvious and easily measured stats -- How often does the batter hit the ball well enough to get on base? How often does a pitcher get three good pitches by the batter? -- and a lot of things that are hazier -- Was that out because the batter failed to bat the ball well, or because the fielder made an amazing grab? Did that pitcher pitch a no-hitter because he's Nolan Ryan or because he had an amazing defense behind him or because "no hits" doesn't necessarily mean "no runs score"*? * -- Look at that bottom one: Ken Johnson of the Houston Colt .45s, the only pitcher in MLB history to lose a complete game no-hitter. Normally, the player who scored that run would be a footnote to a footnote. Except it was Pete Rose. I made the mistake of reading the book and loving it, thus seeing this movie was a huge, phoned-in disappointment. I don't think I've ever left a movie before going, "Needs more math!" but seriously, it did. I really enjoyed this, but could've happily had all the kid scenes cut. Yet here's the thing about sport. It's always possible to play the numbers and come up with plays that will let you technically win, or do well, but does it necessarily make for a good spectator sport? After all, sport isn't just about winning, it's about winning over the crowd too. Now I don't actually care that much about sport, but ultimately people are following it for the quality of the game and the individual stories, right? One of the biggest complaints about being an A's fan is the way that they ruthlessly trade fan-favorite players or let them go on to become free agents (Cespedes to Boston mid-season, Donaldson to Toronto, Giambi, Zito to free agency, etc.). So the individual storylines are cut off abruptly for sure. But the on-field play is hardly ever affected, and you actually get a more interesting mix of players when you choose based solely on the numbers. Also I was an extra in this movie, feel free to ask whatever. Loved this movie except for the kind of downer ending. I know zero about baseball and so I'm wondering: what happened to the management team once the A's went on their winning streak? Did all those old, stuck-in-mud guys stay in place? It was stunning to me how they were still making player selections based on crap like what a guy's girlfriend looked like or whether even the player himself was good-looking or not. Yet they were willing to hold onto to players who were considered hot or "men's men" but whose prima donna behavior was destructive to the morale of the team. Did the old fogies ever see the folly of their ways? The problem with moneyball is that in the age of no salary caps, you only win if you're the only one playing it.